We got to Straddleline on Friday morning and set up, then did a few practices. They had done a few changes to the track that I really liked. I thought the track was a lot of fun. I felt really fast and comfortable after doing a few practices on Friday. From practice Saturday morning I could tell I would need a good start or I would be taking a lot of roost the whole moto. First moto I didn’t have a very good start. I was in fourth and used all my tear offs in the first two laps so I couldn’t see anything. Then I jumped one of the big table tops and landed on a huge rock which wrecked my nerf bar and I got passed over a double, so I ended up fifth in that moto. That was pretty disappointing. The next moto, which was the first Schoolboy Sr moto of the day, I went out on my practice bike because my nerf bar was so wrecked it was rubbing on the rear tire and the peg was bent back really far. I decided to use the practice bike til we had time to fix the race bike. I got a good start on the practice bike, I came out third in the first corner and was right behind second but couldn’t make the pass. Two laps into the race my front right tire went completely flat so I had to roll everything but still managed to stay ahead of a few people and got another fifth. I was pretty disappointed at this point, not because of my finishes just because of all the problems I had in just two motos. I put it behind me going into intermission and helped my dad fix the nerf bar on the race bike enough to use it again. Second Production B moto I got a great start right behind James Garcia and stayed close and pressured him the whole first lap. I was able to make the pass for the lead in a corner and pulled out a bit on him. I had a comfortable lead to take the moto win. I was very happy at this point not only because I got the win but because I rode great and had no problems the whole moto. Last moto of the day (second Schoolboy Sr moto) I got another great start behind Jack Kellogg and pressured him for two laps. Then I was able to make the pass and hold on for the win to end the first day on a great note. First Production B on Sunday I had a horrible start! I think I was nearly last, but made some great passes right til the end including my last pass in the last corner. I was able to pull out second place. First Schoolboy Sr moto I grabbed the holeshot and never looked back, pulling out a comfortable lead and taking the moto win. Second Production B moto I had another great start right behind James Garcia and pressured him hard for a few laps. I was able to make the pass which is very hard to do on James. I pulled out a good lead and was fortunate enough to get the moto win. Last moto of the weekend was a great one. Griffin Lyons got the holeshot and I was right behind him. We battled the whole moto but I couldn’t make the pass as Griffin is very hard to get around. I was right behind him at the finish and got a well earned second place. 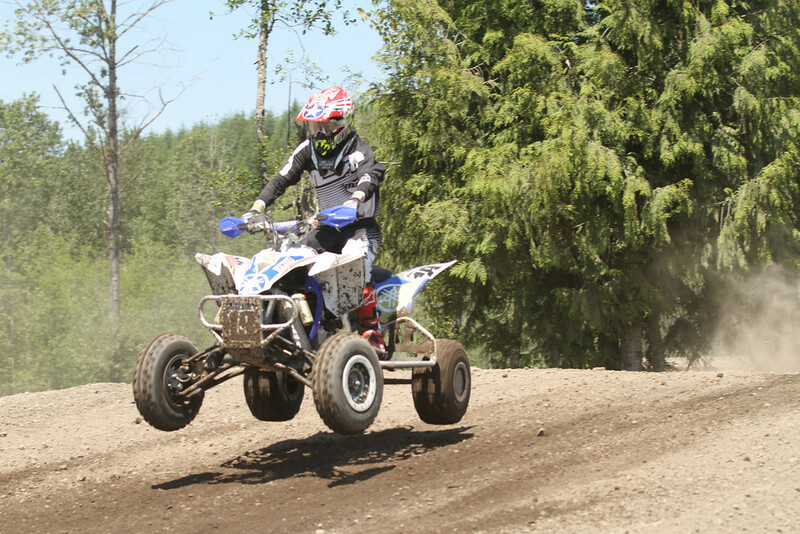 For rounds 11 & 12 we went to a brand new track which I was very excited about – Airway Heights MX in Spokane, WA. We got to Airway Mx track on Friday morning and got all set up. Then I went out on the practice bike and got used to the track. I fell in love with it after just a few laps! It was such a fun track, it had a lot of doubles and lots of big berm corners. First moto Saturday morning in Production B I had an alright start right behind Hunter Friesen and Hurley Villiard but going into the third or fourth corner of the first lap it was really slick from the track being watered and I spun out. I went off the track which put me to last but I made some good passes and was able to get a third and finish right behind second. The first Schoolboy Sr moto I got a good start behind Jack Kellogg and was able to make the pass after a few laps and take the win. Second Production B moto of the day I got a good start but got bumped over the berm in the first corner and was dead last once again! I had to work my way up through the field and was able to come back to third again closely behind second. Last moto of the day was Schoolboy Sr. I got a decent start behind Jack Kellogg again, but I could not make the pass around him. I held on for second place. First moto on Sunday in Production B I got the holeshot and was able to pull a decent lead and earned the win. First Schoolboy Sr moto of the day I got another holeshot and was able to get the win as well! Second Production B moto of the day I had a bad start. I started to make my way up the field but I didn’t have enough time to to get to the lead, but still managed to get a third. The last moto of the day in Schoolboy Sr I was third off the line and passed second in the first lap. I was catching the leader but went over a berm and got stuffed in some hay bales which sent me into third again. That’s where I stayed the rest of the moto. All in all in was a good weekend and I managed to maintain my points lead in both classes. I would like to thank Pit Traffic, Shorai lithium batteries, Morgan Racing, PTI Graffix, MX Wash Mate, Daytona Powersports, Devol Suspension, Pro Armor and everyone at Quadcross Northwest for making the series possible. 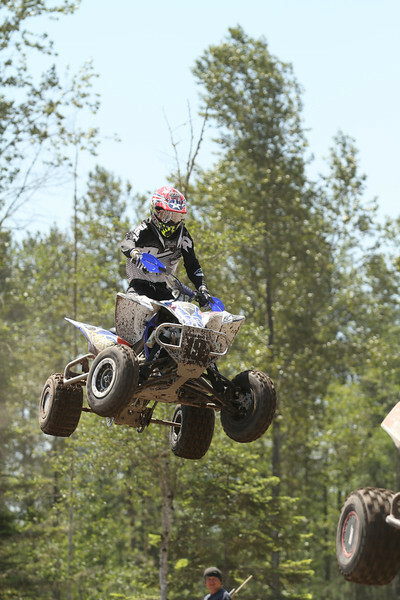 For Immediate Release: JRi Shocks UTV racers win Heartland Challenge.